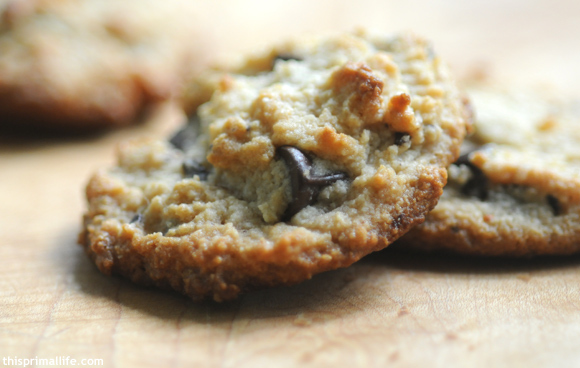 Yesterday I posted a master recipe for create-your-own primal cookies. 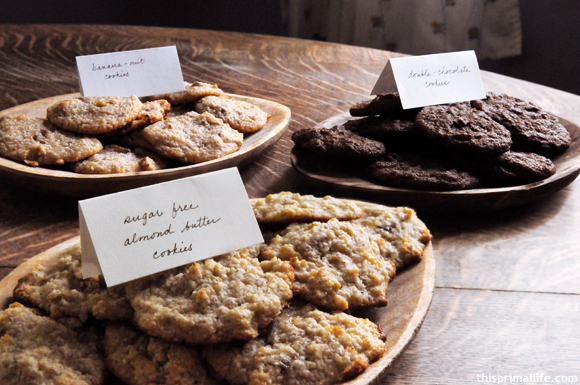 Today I will share with you some of the cookie recipes I came up with. I won’t call these primal because let’s face it, they aren’t. They are, however, grain free, use a minimal amount of natural sweetener, and to my surprise, look and taste like normal chocolate chip cookies. No joke. Preheat oven to 350 degrees. Mix dry ingredients in a bowl, set aside. Mix wet ingredients in a separate bowl, add to dry ingredients and mix until well combined. Fold in chocolate chips. Spoon batter onto parchment-lined baking sheet. Bake for 10-13 minutes until set and slightly toasty. These will firm up as they cool. Double Chocolate Chip Cookies: Add 2 tbsp of cocoa powder to the dry ingredients. This was my attempt at making a more primal cookie. I substituted erythritol for honey or agave nectar, which worked wonderfully. Since I was adding the almond butter, I tried cutting down on the amount of coconut oil. The batter got a little dry. No matter I tossed in an egg and a banana! Preheat oven to 350 degrees. Mix dry ingredients in a bowl, set aside. Mix coconut oil, erythritol, mashed banana, egg, almond butter and vanilla extract in a separate bowl, add to dry ingredients and mix until well combined. Spoon batter onto parchment-lined baking sheet. Bake for 10-13 minutes until set and slightly toasty. These were Daves favorite. I call them banana-nut because they do actually have bananas and nuts in them and I dont know what else to call them. These remained fairly soft, even after cooling. If you like a softer, chewy cookie then these are for you. Preheat oven to 350 degrees. Mix almond flour, baking soda, cinnamon, and salt in a bowl, set aside. Mix coconut oil, honey, mashed banana, and vanilla extract in a separate bowl, add to dry ingredients and mix until well combined. Fold in nuts and seeds. Spoon batter onto parchment-lined baking sheet. Bake for 10-13 minutes until set and slightly toasty. They look and sound absolutely wonderful!!! I’m going to try your chocolate chip cookies when I can get more almonds. They all look soft and tasty! Grok – Thanks. And I hear you. Elizabeth – Maple syrup sounds like a delicious substitution. I don’t always follow recipes exactly, either. Besides, it’s often more fun not to! Strange that your dough was so much dryer… maybe we started off with slightly different amounts of the almond flour. Just found this site via Tastespotting. When you say almond flour, do you mean almond meal or blanched almond flour? Thank you! Hi Raissa – I used almond flour. These look wonderful, I’ll have to find some almond flour, just have almond meal. P.S. The reason Elizabeth’s cookies were drier was the added cocoa. It’s like using more flour, spoon for spoon. What can I say, I like to share. These look yummy, and by coincidence I just found 72% cocoa chocolate chips the other week at my local Whole Foods store… 🙂 I really like the idea of “double chocolate” with the added cocoa, so I’ll probably go there when I try this! These are all such great recipes, I love how wholesome and healthy they are!! i made it with almond meal and it was still delicious 🙂 only got 10 cookies out of a batch though. gotta go make more!! I tried these tonight and they were delicious! My kids liked them too! The only thing was that I thought they were a little too sweet (which surprised me). Next time I think I’ll try them with 2 tbsp agave (or maybe maple syrup). Thanks for posting! Rachel – I buy almond flour (aka almond meal). I have bought it online from honeyville http://store.honeyvillegrain.com/blanchedalmondflour5lb.aspx and have also bought it at Trader Joes. The former is blanched (skins removed) and has a finer texture that I prefer over the Trader Joe’s almond flour, but both work! Yes, you can apparently make your own almond flour or meal pretty easily by throwing some almonds in a food processor but I have not tried it. Yummy! Have been doing low carb for the past several years, and recently discovered the Primal Blueprint. That which lead me to your blog. Have been seeking healthier baking alternatives, and this was my first attempt at making cookies using almond flour and agave. Have to say I was very impressed with both taste and texture. My biggest critics (my kids) even gave it a thumbs up. This is definitely a keeper, and I’m looking forward to trying out some other recipes for my collection. Thanks! If you use a banana in the “sugar-free” cookie each will have about 3g of sugar. I just finished making the Chocolate Chip version and they came out amazing! My kids loved them! I used Ghirardelli dark chocolate chips and made them into mini-cookies- ended up with 32. I highly recommend trying them and I thank YOU for posting a great recipe I will use for years to come. My mouth has already been drooling just from reading this recipe. these delicious recipes. These are delicious! My husband and two sons said they would eat these over regular cookies any day! Thanks for the recipe! Hey Shelley, I’ve had a huge problem, with almond flour in general. I’ve done your pizza recipe and just now these cookies; for some reason the flour doesn’t hold together. Any clue as to why? The recipes taste great, the flour just won’t stick! Do you have any idea why? Hi Marco – Are you grinding the flour yourself? I use pre-made almond flour that I either buy online or get from Trader Joe’s. If you;re making it yourself, though, you may not be grinding the almonds fine enough. Hmm, no I buy Bob’s Red Mill almond flour. It seems to be pretty finely ground but now that you mention that, I have noticed that it seems to be too “grainy” at times (oddly enough haha). I think I’m going to grind this one even more and see how that works. I ended up experimenting with a second batch of cookies last night; added an extra whole egg and they came out perfect. You think that would work for the pizza crust too? Thanks Shelley! Made the chocolate chip cookies with sugar free chips and erythritol instead of agave.. awesome, and such an easy recipe! Oh my! Delicious. I haven’t had chocolate since going gluten and refined sugar free (I’m almost grain free too). Definitely a keeper. I substituted honey for the agave because that’s what I had on hand and used almond meal. Letting them cool to firm up is key. Also I think next time I’ll try adding just a little shredded coconut. Almond flour textures vary widely. Almond meal and almond flour are not the same and will affect the results of a recipe. When you want light and fluffy, then a good blanched almond flour is necessary. I don’t think you can make it at home unless you have a very good mill (coffee grinder doesn’t count here, lol) TJs and BRM are not fine enough. Nuts.com has a very good almond flour as well as some other great GF baking mixes.